Picture custardy French toast, infused with cinnamon and vanilla, fresh from the griddle and drizzled with warm maple syrup. Now picture that in a glass. Boom. Mind blown. So dark brown that it's more black and very little light gets through. There's a fingernail of brown on top. The aroma is of buttery maple syrup with a hint of cinnamon. It does taste like French Toast. The maple syrup dominates here, but I like it. More than 12 ounces would be overwhelming because it is so sweet. The mouth is lightly sticky and chewy, which seems fitting. Pours a dark brown with a little bit of lacing at the top. Smell is strongly of maple syrup, like sniffing a bottle of maple syrup, cinnamon, and vanilla. The smell certainly matches the name. Taste is malt, vanilla, maple syrup, cinnamon, nutmeg. Medium body, lingering taste. It is as advertised, a brown ale that tastes like drinking french toast. Certainly tasty, not overly sweet but I'd prefer this as an evening beer...or maybe first thing in the morning, heh. 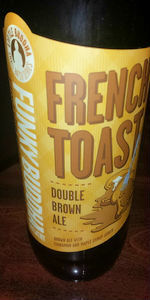 Maybe I am more of a French toast fan than I think I am, but this beer is my crurent favorite beer, period. I love FB’s Morning Wood and FB’s other amazing Stouts and Porters, but this is the most drinkable of them all. Huge maple syrup and cinnamon, but... it’s Freaking amazing!!! Best beer I can get on a regular basis. Pours a murky brown, not much lace or head, settles nicely, good color. Aromas strong with maple, chocolate, and coffee, very similar to their Maple Bacon Coffee Porter or for you cereal lovers, that Eggo cereal that used to be on the shelves. Cinnamon, vanilla, and maple flavors. As it warms, more of that toasty malt emerges, but overall the flavors are there and it drinks really smooth. A tad thin, pretty heavy carb, but very smooth. Lightly sticky finish.